In reality there are endless varieties and countless styles of solar cookers that have been made, and are continually being modified around the world. For our purposes though we will use the three main styles (classes) that are in use today. Most all of the solar cookers in the world today fall within these three categories, with many usually being a combination of the three styles; for more effective cooking results. In the past most were fabricated or constructed by individuals using readily available materials that were usually acquired at home or the local hardware store. Even now, at this time though, many around the world through necessity, and also as an option, still construct home made solar cookers and use them with very amazing results. 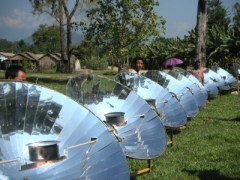 But because of the growing awareness of the feasibility of using solar energy for cooking, and the increased world wide use of solar cookers, some organizations and businesses have begun to manufacture a variety of solar cookers, in the various styles and classifications, for sale on the commercial market and also for charitable donation toward humanitarian related efforts in economic, climate and war ravaged areas of the world. 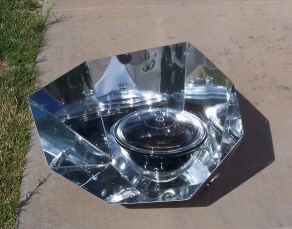 What is your favorite Solar Cooker? The most common and popular variety is probably the box cooker. Its design is based on the concept of a traditional modern oven where the food is placed inside of an insulated box for purposes of retaining or trapping the solar rays that have been converted to heat energy. A box cooker can be made out of any type of material such as; wood, plastic, cardboard, etc. Usually two boxes of varying size are needed in order to be able to fit the smaller one inside of the larger one, thus creating a gap or space around the smaller box which can then be filled with paper, hay, fiberglass etc. to form an insulating barrier between the two boxes to prevent the escape of heat through conduction. Manufactured boxes are designed and built with the gap and insulation ready made. Finally a transparent cover on top of the box is needed to permit solar rays to enter the box and at the same time prevent the escape of the (UV) rays that have now become solar energy (heat).The transparent cover can be created by using plastic sheets, glass sheets (preferably tempered so as not to break) or by using oven cooking bags. Reflector panels are usually added for purposes of concentrating the suns rays toward the cooking pot and food for higher cooking temperatures and effectiveness. These cookers can typically reach temperatures of 300° F (150° C) which is plenty hot to cook any food you would like. Food containing larger quantities of moisture cannot get much hotter than 212° F (100° C) so it is not necessary to cook at higher temperatures. The panel cooker usually consists of a cooking vessel (pot or pan) which is usually darkened or blackened, an oven cooking bag or transparent glass bowl along with a reflective panel. These panels can be made from aluminum foil over corrugated carton, or from tin or sheet metal panels polished to a high sheen and also with mirrors. The oven bag or glass bowl allows the suns UV rays to penetrate towards the food in turn trapping the energy; (heat) preventing its escape. The reflector panels concentrate the sun light onto the cooking vessel containing the food, in the same way the panels do so on the solar box cookers. A panel cooker is usually simpler and more economical to build and results in the same cooking effectiveness for most all situations. Some panel cookers can achieve relatively high temperatures depending on the pot and the food being cooked. Since most foods cooked in these types of cookers usually contain more moisture (soups, stews, meats etc.) they will usually cook around 225-250° F; similar to a slow, or crock cooker. Often known as, and called concentrator cookers, these are usually a bit more complicated to construct due to the design and necessary materials, but still are quite common in some areas of the world. The parabolic cooker can reach high temperatures more quickly, therefore cooking is accomplished more rapidly, though more frequent adjustment of the concentrator is needed for maximum effectiveness. It is often necessary to use them under the supervision of experienced hands since they can cause harm if used improperly. Some parabolic cookers are limited in the quantity of food that is possible to be cooked at one time since they usually have only one pot that is suspended in the center of the path of highest solar energy concentration, but as mentioned earlier they can cook faster. These cookers have been used on a large institutional scale in China for many years along with a few other countries. Here I show you the manufactured versions of all three types of cookers available from our site and give you a little more information on how they work. See also our Solar Ovens Comparisons page for the top commercial solar cookers. See more details on our full line of solar cookers, get the information to make a more informed decision when purchasing your own solar cooker.